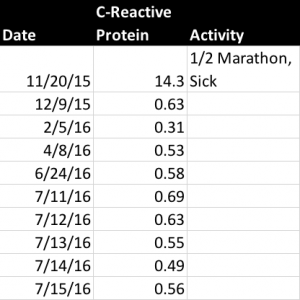 Who Gets 67 C-Reactive Protein Tests? I do! Ironically, this was also when I got my first NMR as well. After some panicky message passing to my doctor, I found he wasn’t quite as worried once I gave the context. It has been two days after (1) I had finished a half marathon and (2) gotten terribly sick afterward (nausea, vomiting, etc). He said this can happen with runners and wanted to test again in three months. Eff that, I thought. I’m going to pay out of pocket and test in two weeks, along with getting another NMR. You already know about this two week period from many of my podcast interviews and presentations, but you’ve never heard me talk about CRP before. The reason for that is simple — my doctor was right — my next CRP was just 0.63. And for the next eight tests afterward, it would be under 1.0. During this period I was intentionally avoiding any intensive exercise. I typically fit in a walk of around 2-3 miles a day, but would otherwise keep from anything very exhaustive. This was due to my wanting to control this variable for my research. Of the nine CRPs from that period, five took place over the Identical Diet Experiment I took with my sister that summer. I was impressed at just how consistent they were. Not only were each under 1.0, but the marker was 0.31 at the lowest, 0.69 at the highest for just a 0.38 delta. That’s pretty small. Overall, I was pretty happy to see the consistently low numbers, further emphasizing the original 14.3 was indeed related to both the exercise and getting sick. Little did I know I was about to confirm each would boost this number independently. That… and that this would actually be my third highest score! 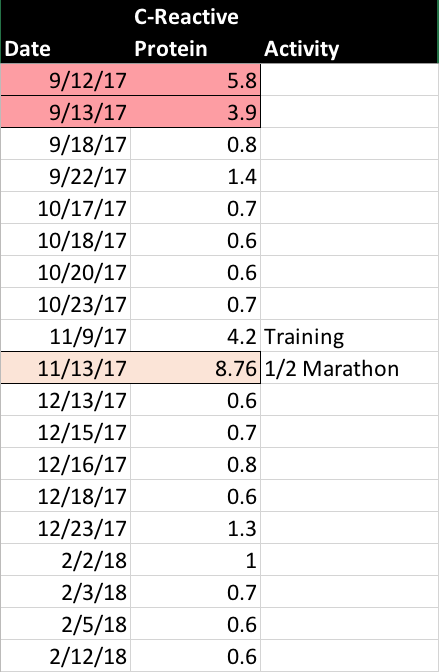 Knowing in advance what the previous half marathon did with my CRP, I was especially curious what my numbers would look like when taken 24 hours after a race. Needless to say, we have plenty of confirmation these running phases certainly had an impact on my markers. Generally, I was focusing on many experiments over this period of time. Starting at around April, most of the experiments involved various versions of carb-swapping, so I wasn’t sure what effect it might have on my CRP. But overall it appeared to hold pretty steady. 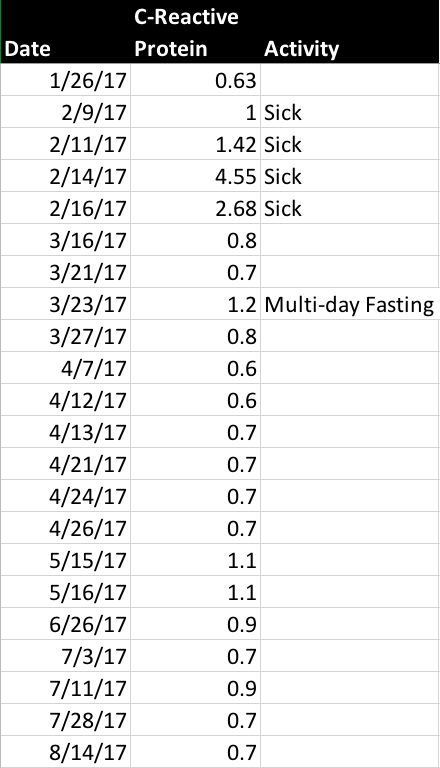 However, I did have one period of time where I got sick during an experiment in February. My CRP happened to reflect this with a sustained bump over that period of time quite prominently (although nowhere near as dramatically as the distance running. As I’ve talked about with Siobhan many times over, I’ll try to be mindful to get regular blood testing the next time I get sick as I’m very interested in having that data for further comparison. 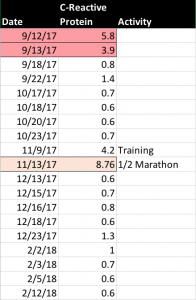 My wife and I did one more 10k followed by a half marathon on November 11th and 12th, respectively. Without surprise, I saw my CRP rise in the test taken 24 hours after, then return to baseline as I expected. Okay, so we have a seemingly strong narrative that explains every bump in CRP to be sickness and/or exercise. But what about September 12th? I didn’t mark it for either. As it happens, that’s when I was doing my first additive carb experiment (which I haven’t had a chance to do a post on). However, the test the morning of the 12th was the baseline. In other words, I hadn’t yet ingested any carbs by that point, so carbs can’t be suspected. There was one thing that stood out about that time: stress. Just before that, I was in the process of launching the Patreon. At my current rate of savings depletion I was going to be in bad shape were I not to do something soon. So I was finally taking the advice I was given countless times before after reaching a bit of a stretch point. So in a sense, it wasn’t just money stress by itself, it was also the stress of hurriedly putting together the Patreon and getting it ready to launch. But moreover, I’ll concede it was actually difficult for me to request the help. I’ll have more about this fateful time in my book. But needless to say, it was a challenging period of time in my life and I wouldn’t be surprised if my stress levels were at much higher than normal levels. Was that the real reason? Your guess is as good as mine. Just added you on Patreon. It’s not much, but it’s what I can do for now to help out your continuing research. Cheers. This makes me feel much better. I got an inexplicable 3.0 on my test in January. 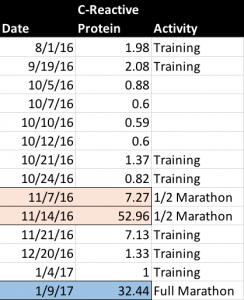 I dug out my training log and found out I had just done a really long run the day before. This is a little off-topic for this post, but… I understand you started this journey with a high glucose result. How is all of this affecting your glucose? My fasting glucose is typically in the 90s with an occasional dip into the high 80s or increase into the low 100s. This typically has to do with what I ate last and how long it was between that meal and my going to bed. I had a CRP test result come back at 10.9. Yikes! I’m prediabetic and had an extremely stress filled week and went to the ER due radiating pain in my chest/stomach area prior to the test. I assumed the high CRP score was caused by eating too many carbs but stress/sickness may have played a part in it also, am I correct? I was able to lower the CRP score in 3 months to 2.5. by eating a keto diet. Yes, sickness for sure can influence CRP. 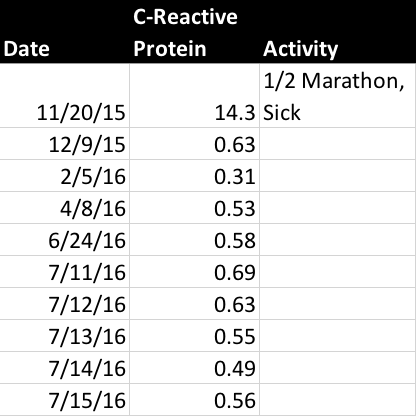 I’ve tested CRP while I was sick even with mild colds, it ranged from 0.5-1 (normal/healthy) to 48 (fairly sick/fever). If you suspect you were sick when you got tested, getting a retest when you feel better might be warranted. Sickness can also affect other markers too (including your lipid panel, depending on the illness!). I’m not sure about stress, but chronic stress is tied to things like worsened insulin resistance, so there’s certainly a possibility. Exercise can also influence CRP… it’s a finicky test, but combined with other markers it can be helpful to determine over all health. Taken alone, it can result in some confusion. Dave, great work that I have just become aware of. As a follow engineer (Electrical and Systems) the first question I have is, “How do you baseline your system?” Followed by if I make a valuestream map of the curren system what do I want the future state to look like? Data driven decisions should drive any change and it seems the current medical system is not equipped to do this. So how do we do this? Thoughts? 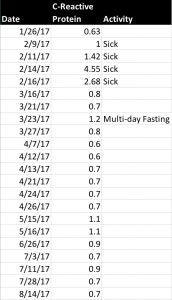 I’m an average LCHF guy and I practice a 16/8 daily fasting schedule. 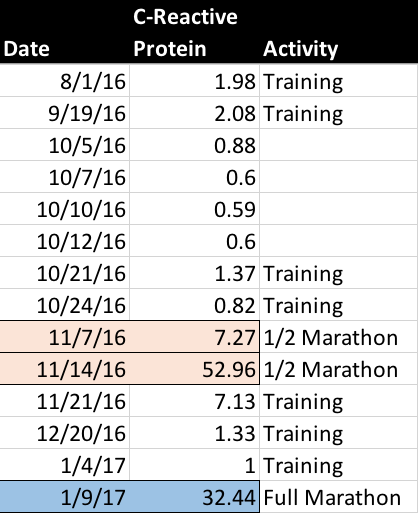 Recently I went two week experiment of getting into full-on >20g of net carbs and protein to 1.5x body weight. To simplify things I ate the two same meals for lunch and dinner everyday and I do high intensity resistance training 3x per week. I was also calorie deficit but tried as I could, I just wasn’t hungry and didn’t care to eat more. My glucose hit personal bests below my average of 105 mg/dL and my HBA1C came in at 5.3%. Kidneys and Liver tests came back clean. Lipdis are as expected: HDL normal, LDL elevated and Triglycerides below normal. TG/HDL ration are 0.8 (mmoL) and 1.8 (mg/dL) respectively. However my HS C-Reactive protein came in at 9.2 mg/L and my doctor was alarmed as it’s 3x higher than the cutoff for high-risk. Reading this gave me some comfort because the day before the test was a hard day at the gym. While I didn’t do a half-marathon like Dave, I push myself hard each workout. Maybe it was a mistake to take a test less than 24H after that session. I was wondering, based on how I work out, how then should I get a solid read on inflammation in my body? Should wait a few days after a strenuous workout? A week? The big goal here is to determine: is there inflammation in my body that puts me at risk of heart disease despite my other measures? Any thoughts on this Dave? Thanks for all your work! Based on other active people who’d done the test, and had the pleasure of troubleshooting, it seems best to avoid strenuous exercise for a few days leading into the test.